Beginning with Man’s earliest discoveries of the concept of Time, the renowned science writer Isaac Asimov once again turns his brilliant intellect and sharp literary craftsmanship to the task of illuminating a wide range of scientific concepts. His topics are as varied as is his own encyclopedic knowledge of scientific fact and fancy. Here are sparkling, lucid discussions of man’s attempt to measure time—and control it, gravitation (not the strongest force in the Universe! ), the fascination of Roman numerals, the meanings of planets’ names (Why is it correct to speak of “Venerian atmowphere” or even “Cytherean atmosphere [sic]—but not “Venusian atmosphere?”), the magic of measures (Quick! What do 2 quarts make? Why, a pottle, of course! ), intriguing speculations on man’s mortality, and much more—a breathtaking voyage of discovery in space and time by the man who has revealed the mysteries of science to millions. I wouldn’t consider this collection of F&SF essays as quite the equal of its predecessors, but I still enjoy it. On the whole, there are few of the seventeen essays which stand out. Among them is that rarest of birds, an Asimov mood piece. The last essay in the collection, “The Slowly Moving Finger” begins by reciting an account of the death of the Asimov family parakeet and moves on morbidly from there. It is an interesting essay in its own right, considering the relative length of the human life-span, but is nonetheless permeated with this sense of futility throughout. (And, of course, it becomes rather poignant that one must now read it after Asimov’s own demise, in the decade which he identifies as the usual one for modern humans to die in—their eighth—and well before the top limit of the human life-span which he sets at 115.) I can think of nothing else like it in the Asimov corpus except, perhaps, Forward the Foundation. Another outstanding essay is “Just Mooning Around,” which talks about the tug of war each planet has to fight with the Sun for its own satellites. Beyond providing an interesting perspective on the solar system, it has a rather prescient speculation that once we leave our solar system, we might find perhaps half the gas giant planets have rings like Saturn’s. Of course, it turns out that all the gas giants in our solar system have ring systems, although Saturn’s ring system is uniquely large. “Round and Round and…” similarly has an interesting perspective on planetary science, discussing how long the “day” is on various bodies in it. And I love “Forget It!,” although I’m not sure I really need to remember why. 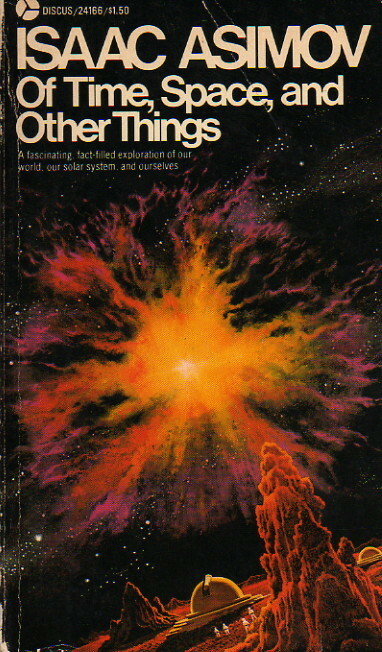 Some of the other essays are also mildly memorable (“First And Rearmost”—just how weak is gravity anyway?, or “A Galaxy at a Time” on exploding galaxies), but by and large this is not material which Asimov doesn’t cover elsewhere just about as well. Indeed, the opening essay, “The Days of our Years” is rather pale compared to the full-fledged treatment of the same subject, The Clock We Live On, and “Welcome, Stranger!” is not to be preferred over its book-length treatment, The Noble Gases. Like all F&SF essay collections, of course, the book is more than worthwhile—it’s just not as worthwhile as some. And one note about the cover: Avon got the title wrong. It’s also wrong on the spine, but it’s correct on the title page. To make things even more exciting, there’s a punctuation error on the back cover.